On Saturday, Slick, Donald and the rest of the Watts Basketball crew spent a fun-filled evening at the season opener at Evergreen Speedway. The event got off to a hilarious start as the entire crew was invited to go go-karting before the race began. Following the go-karting, the Watts crew posed for pictures and signed autographs for fans. Slick even signed one of the cars racing in that evenings competition. 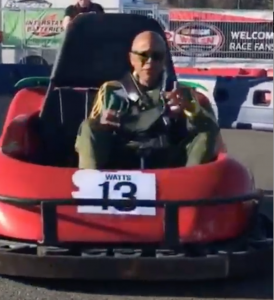 For the race itself, the Watts team were treated to box seats to take in the figure eight racing that left everyone on the edge of their seat. Motor Speedway for hosting us and we can’t wait to be back in the future!